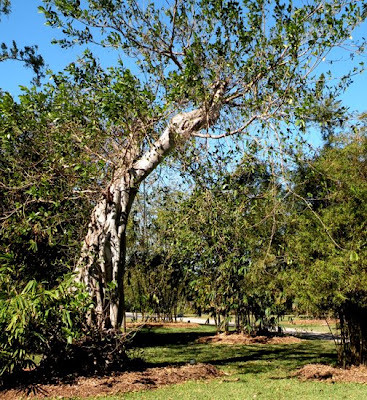 Leon and I have a membership to Fairchild Gardens, a really fine botanical garden in Coral Gables. We first visited because of Leon's interest in cycads. I'll avoid comment on the degree to which his collection takes over the house when he moves it inside for the winter. 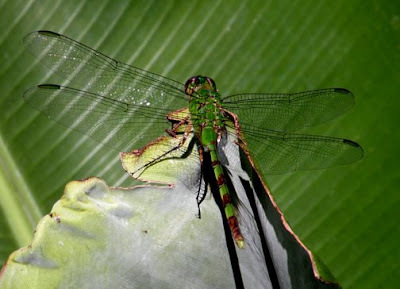 Fairchild has a huge and diverse collection, and has provided a fair bit of support for research and conservation of the group over the years. For that alone, we decided to support them and become members. 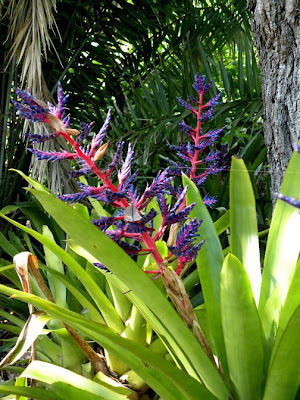 Aside: Yes, I know the photo is a bromeliad and not a cycad. It's my blog, I'll post the picture that I find prettiest as the header. 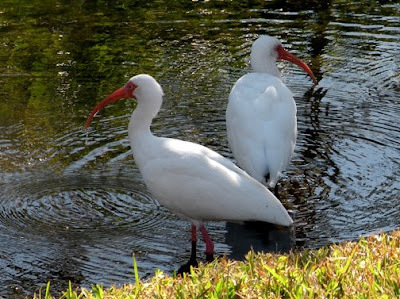 We were greeted upon our arrival by a flock of white ibis. They're one of the birds that I always enjoy seeing in Florida because they look so tropical to me. 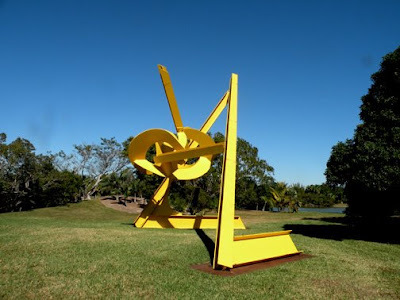 As we strolled the grounds, we began encountering a series of huge sculptures by artist Mark di Suervo. They are mammoth installations constructed from I-beams and steel plates. The scale is well matched with the large scale of the gardens, and the rigid, angular forms in vivid primary colors provide an interesting counterpoint to the natural spaces that they are embedded in. My favorite piece of his was Neruda's gate, named for one of my favorite poets. I recided a couple of verses from Vienen los Pajaros as I walked through. Then I realized that I had a recording of Canto General on my iPhone and played part of Vegetaciones. I'm not sure that Neruda would have approved of the latter, involving as it does an item that currently embelmizes captialism. The gardens are, of course, the main event at Fairchild. 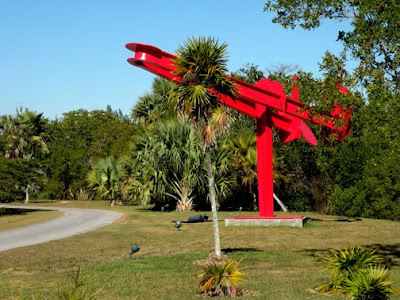 We strolled to the Florida Keys plantings, and wandered through the planttings that the di Suervo sculputres were set in. I got a lot of response to my posting about the strangler fig the other day, so I took advantage of an opportunity to get a shot of a mature specimen. There was only one plant that required a sign requesting that visitors not pick the fruit. Totally understandable, I was tempted. Can you tell what it is? My other great enjoyment from my morning at Fairchild was getting to see, and photograph, some insects. There wasn't a lot out, but I did get a couple of dragonfly shots. unless one of my readers calls it for me before then. This was totally a taste of summer. I highly recommend Fairchild Gardens both as a place to visit, and an institution to support (the latter only if you are already supporting the Peggy Notebaert Nature Museum, of course). I think the mystery fruit is a cocoa bean? Yes I agree its a Cocoa bean Doug, I almost confused the spelling with Coca, now there definitely would have been a sign up about that one. Great to see Dragonflies in Winter. 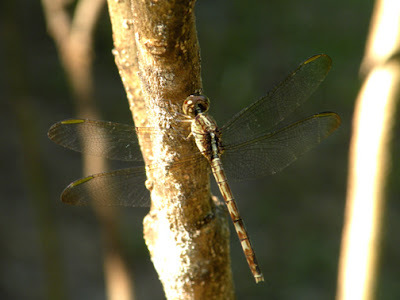 It is such a treat to see dragonflies in February. Great sunny, warm photos. Anonymous- Welcome to the Tapestry. 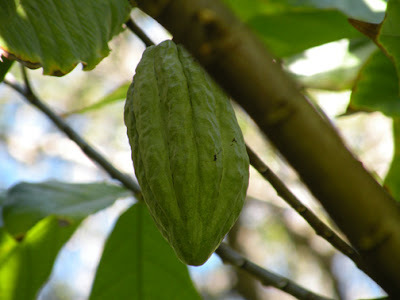 Yes, it was a cocoa bean. Believe me, I looked for both Atala adults and larvae. None to be seen, though some of the coontie appeared damaged. I think it was the cold weather. I have seen Atalas back in the early 1980s on Key Biscayne. They're gorgeous. Roy- Haha, yes, it's cocoa and not coca. Though I have seen the latter while backpacking in Peru some years ago. Robin- It has been wonderful. I'm hoping for some more good insect viewing tomorrow. There is smothing missing in these pictures Doug and I cannot think what it is.....Hmmmm...oh now I know, NO SNOW!! LOL!! The colours, the water, the warmth that radiates from the LCD, the rocket launcher. OK - that's it. I'm southbound again by Friday. Revisited videos of S.FL and can't take 16 degrees (but it feels like 1) anymore. Yet another place I can't afford to visit - it may be time to go rogue. Is it warm there? Joan- Leon has often indicated an interest in visiting South Africa to see the cycads (among other things). I'm off to Big Pine Key today. Dr. Know- I feel your pain. It's supposedly 4 in Chicago right now. I'm very glad to be here at the moment. 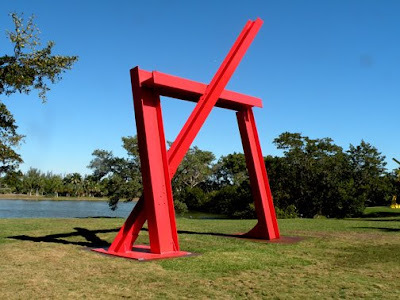 Hey...there were some di Suvero sculptures last year in Millenium Park. I'll bet you are so glad to be in that warm sunshine instead of Chicago snow and wind! 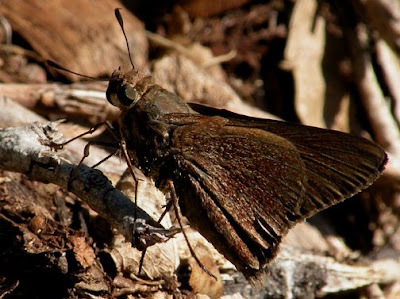 I saw some butterflies at Patagonia Lake SP this past Saturday. Gus got some nice shots which I will post for MY World next week. I believe we have (or had) some Mark di Suervo pieces in Millenium Park don't we? I love the colorful sculptures! Beautiful images! A man of many talents. And any man who has a recording of a Neruda poem on his i-pod is a real man. Wow! Impressed. When are you going to join facebook with the rest of the nature-blogging community? Then we could trade Neruda poem videos.